Justice Week is a week long celebration and awareness campaign of contemporary social justice issues. This annual event is hosted by the National Lawyers’ Guild – UMass Law Chapter, and other UMass Law affinity groups. This year’s theme is: “Gender, Gentry, and Grace.” We will be looking at the impact of the #MeToo movement, the state of immigration, Bail Reform, and more parallel social justice issues. While the discussion of these issues in our current political climate may bring out frustration and sadness, we want to use this time to celebrate the silver linings that bring us together and unite us. 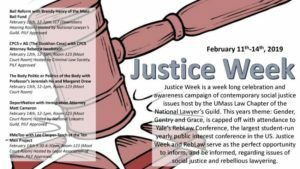 Justice Week is capped off with attendance to Yale’s RebLaw Conference, the largest student-run yearly public interest conference in the United States. Among this year’s keynote speakers at RebLaw is Philadelphia District Attorney, Larry Krasner, a prominent proponent of criminal justice reform, focused on spearheading the campaign to end mass incarceration. Justice Week and RebLaw serve as the perfect opportunity to inform and be informed regarding issues that may be necessary for effective movement lawyering. We look forward to the opportunity to gain and imbue knowledge with you in our pursuit to justice! Please see below for the scheduled events of this year’s Justice Week. February 11th, 12-1pm, LL7 (Downstairs Hearing Room); Hosted by National Lawyer’s Guild. According to Massachusetts Law, bail is meant to ensure that people return to court. However, research shows that reliance on cash bail is no better than effective pretrial conditions or phone or mail reminders in ensuring that a defendant returns to court to address his or her case. Today, in our Southcoast community, many women and men in Bristol County Massachusetts are locked up, legally innocent, but unable to post bail, sometimes as little as $150. The longer they are locked up, the more likely it is that they may lose their jobs, apartments, connections to social services, counseling & treatment, even custody of their children. Join Brandy Henry of the Mass Bail Fund to hear how they are reforming the cash bail system in their own unique way by creating a community fund. February 12th, 12-1pm, Room-123 (Moot Court Room); Hosted by Criminal Law Society. In its decision in Committee for Public Counsel Services v. Attorney General (CPCS v. AG), the Massachusetts Supreme Judicial Court dismissed thousands of drug cases found to have been tainted by misconduct by a state chemist at the Amherst Drug Lab and, later, prosecutorial misconduct by two former assistant attorneys general. Hear CPCS Attorney Rebecca Jacobstein’s firsthand account of this landmark case. “The Body Politic or the Politics of the Body? Professors Margaret Drew & Jeremiah Ho will lead a book-group style discussion on gender and identity performance, and its implications within the law. The discussion will be premised on two very short readings by Judith Butler and Kenji Yoshino. Prior reading is encouraged but not required for attendance. Some hard-copies of the readings will be available—first come, first served—outside Prof. Ho’s office starting Wednesday 2/6. February 14th, 12-1pm, Room-123 (Moot Court Room); Hosted by National Lawyers Guild. Immigration Attorney Matt Cameron, recently returned from US-Mexico border, shares his trials and tribulations, figuratively and literally, with the US Immigration system. February 14th 5:30-6:30pm, Room-123 (Moot Court Room); Hosted by Legal Association of Women. A #MeToo panel focusing on sexual harassment in the workplace. How sexual harassment relates to pay inequity and how men can take on the responsibility of shifting the culture of sexual harassment and violence against women and girls. For more information, please contact Jesse Purvis, J.D. Candidate, at jpurvis@umassd.edu.